High quality, pressure cast, machined aluminum housing (not your usual bent tin version) with precision bubble level gauges. Capable of tilting payloads (up to 2,000 lbs.) a full 45deg in either direction, the Oberg Tilt Lift Sling eliminates the need for endless repositioning of chains for adjusting engine angle during installation and removal. This compact steel unit is designed to provide years of trouble free service. Includes mounting cleats for fastening to any automotive engine. Armed with only a 1/2" rachet, you can now confront engine swaps single handedly without worrying about pinched fingers. The Oberg Tilt Lift Sling features all steel construction, positive lock at any angle, and a take-up, pay-out drum which allows you to progressively tilt an engine for precise alignment. The Tilt Lift Sling, used by professionals nationwide, is safe, easy to use, and compact. It weighs only 4 lbs., yet is rated to handle loads up to 2,000 lbs. with a built-in 3 to 1 safety factor. Introducing Milbar's latest Deluxe twisters. These twisters are the latest iteration of the old "Tigerwave" twisters. All features are the same except for the substitution of normal serrated jaws for the wave form jaws. All the other great Tigerwave features are still there. (1)Cushion throat secures the clipped wire ends so they do not fly off into the nether regions of the shop, fuselage, chassis, etc. to get into tires, fuel cells, electrical units and shoe soles and otherwise cause what airplane guys call FOD (Foreign Object Damage). Saves a lot of time looking for the ends and riding herd over neophytes letting them scatter. ((3) Reversible twist rotation allows right and left handed twists. Experienced wirers will already know that the second twist really needs to be in the opposite direction to the first for the best functioning (and looking) wire job. These are the very best wire twisters money can buy. 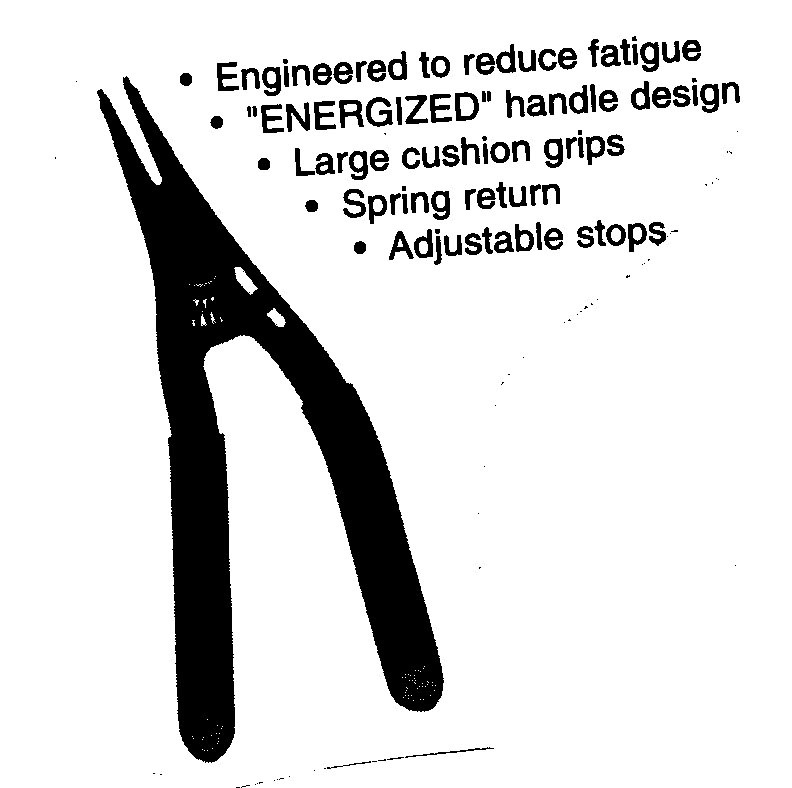 Available in both the traditional 9" size and the more ergonomic 6" version. Dzus Divot Maker, Driver and Knife. The Dzus Divot Maker makes those nice little divots in sheet metal for a professional look. The Dzus Driver has a specially shaped blade to fit the curve slot in Dzus buttons much better than ordinary screwdrivers, preventing camming out and burring of the slot. It has a fat handle for better grip and leverage. Much cheaper than the Snap-On version. The Dzus Knife is a two size, right angle version of the Driver, giving more leverage and improved clearance in tight locations. The two radii mate perfectly with the #5 and #6 Dzus studs. This is a handy spring adjusting tool to effectively set S spring depth. The DZ7301 tool eliminates the need for various depths of S springs. It also dramatically reduces the number of different stud lengths required for any project. By properly adjusting the spring height, you eliminate troublesome fasteners that are either too loose or too tight. Handy gauge to identify AN Bolt dash numbers. Simply hang the bolt from it's appropriate slot (which identifies it's diameter) and read the dash number at the end of the bolt. Saves a lot of mis-ordered bolts. Applicable to all AN 3 through AN 8 Air Frame bolts, AN 73 through AN 78, AN 42 through AN 47, AN 173 through AN 178 and MS 20073 and MS 20074 series. Camlock Specialty Installation Tools For replacement of studs and grommets there are two tools required. The CMT-4P3 pliers depress the spring, thus lengthening the stud and allowing it to be installed in the grommet. The CMT-26 tool is helpful in installing the R4G and R4T snap ring retainers on the grommets. The everlasting Marson HP2 hand pop rivet setting tool. This is still the best buy in hand rivet tools. I bought mine in 1967, and it's still going strong, several thousand rivets later. Comes with collets to pull 3/32, 1/8, 5/32, and 3/16 Pop, Cherry N or Q rivets, and even Cherrymax. Handy kit for determining the port or fitting size, style, pitch, etc. Includes inside/outside vernier calipers, combo mm/inch pitch gauge (narrow to fit inside ports), flare profile gauge (37 degree, 45 degree inverted flare, etc. ), reference manual covering all modern hydraulic port and fitting styles, and a magnifying glass for those over 40. A must for the plumbing neophyte. Saves countless hours trying to describe what you want when ordering and many dollars returning incorrect parts. Handy combination millimeter/inch gauge. Made in U.S.A.
A kit of assembly mandrels to install straight nose ends onto Aeroquip 302/303 or Strato-Flex 111 medium pressure hoses. Also usable with Little Gem and Super Gem hose ends and stainless steel braided hose. Set includes mandrels to do hoses from -3 to -12. Individual mandrels are available on request. 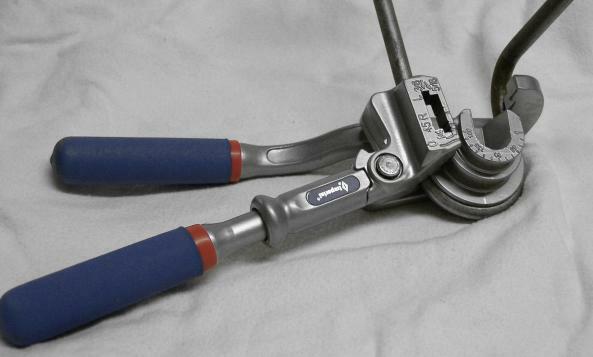 "Bonney" Service Wrenches are the erstwhile AN fitting wrench, popular for years in the aircraft and racing industry. Always hard to find, these wrenches are a badge of honor among race mechanics. Real Bonney men look down their noses at those clunky CNC'd aluminum copies now sold by AN plumbing houses. And for good reason. Service wrenches are slimmer and more ergonomically shaped than the aluminum copies and, being steel, can be physically smaller - thus ideally suited for the tight confines of the race car. As we run out of the original Bonney wrenches we are substituting the Martin wrenches which are an exact replacement. Part numbers correspond to Bonney's number stamped on the wrench handle. The last two numbers represent the wrench's size in 32nds, example: Our P/N 000-T-1224 = Bonney 1224 or 24/32 or 3/4"
True Bonneys are limited to stock on hand. Cheap Asian calipers for knocking around the shop. At this price you won't mind so much when your brother-in-law drops them after his third beer. Actually quite accurate. Everybody should have a set in his tool box, if for no other reason to be able to order parts right. All too many parts orders start with, "I need a screw." "What size?" "Ah, a little bigger than the one I got." "What diameter is that?" "Ah, lemme see. Ah, yah... it's one little mark less than a quarter inch." "Do you mean 3/16ths or 7/32nds?" "I donno - will it fit my hole I've drilled out?" For those who don't want to figure out how to read the dials we offer this direct reading digital caliper. Converts from inch to millimeter at the push of a button. Instantly zeros. Comes with a spare battery. Good value. ...are needed whenever you are making (or repairing) an adjustable suspension link. We recommend you paint code them so as not to confuse them with their RH brothers, a quaint little tendency that has ruined more than a few links -- and sent a machinist or two out my door! The ubiquitous "weird English thread." These taps are a must around any pre-80s oil or fuel system. Deluxe 37º flaring and cutting kit. Contains tube cutter and 37º flaring tool to right, as well as plastic case and full instructions. Pipe cutting tool cuts 1/8 to 1-1/5 (-12) aluminum, steel or copper tubing. 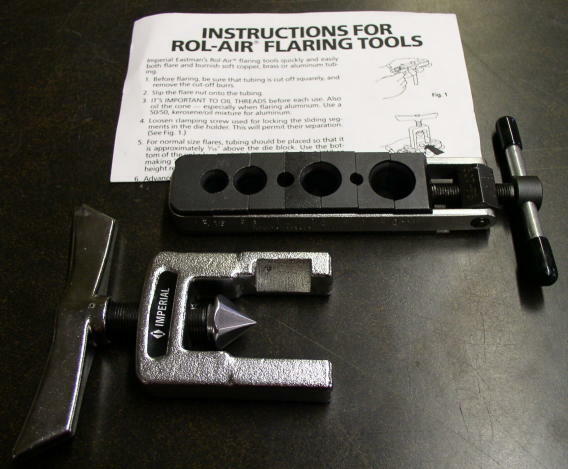 Flaring tool is Imperial Eastman's "Rol-Air" burnishing flaring tool which handles 3/16-5/8 (AN -3 to -10) tubing. 000T1606..........134.20 37 º "Rol-Air" burnishing flaring tool and instructions as used in kit, left. 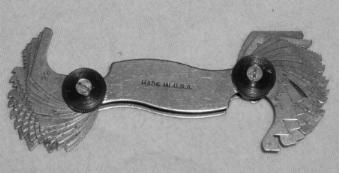 Pipe cutting tool as used in kit, left. Compact tube bender for -2, -3, & -4 tubing. 000T1610............44.99 Deluxe tube bender, does -3 to -6 tubing. This is the best solution to brake bleeding that I've ever used: the convenience of a professional pressure bleeder without the expense. Easy one man operation. Simply pour a small amount of fluid, attach master cylinder adaptor, pump up about 10 psi pressure and proceed to bleed your brakes - alone! No need to pay an extra helper or get into an argument with the wife just to bleed the brakes. No steel parts to rust. Uses minimal amount of fluid, reducing exposure to atmospheric moisture. Easy to clean. Light and compact to fit in your racing kit or a small space in your garage. 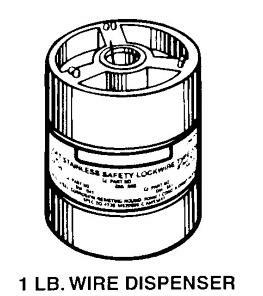 Basic unit comes with screw-on adaptor that fits Girling master cylinders (among others). Other adaptors are available for various Lockheed, American, European and Japanese master cylinders. Complete with master cylinder adaptor to fit Girling small reservoir, and tandem master cylinders. Also fits Tilton and ATE master cylinder reservoirs. As above but also includes 3-1/2" diameter universal master cylinder adaptor for post '85 domestic and Japanese master cylinders, plus a 4 1/4": x 6 3/4" rectangular adaptor for domestic dual reservoirs. Large Girling (2-5/8") reservoir master cylinder adaptor (e.g. brake master cylinder on S1/S2 Elans). Also fits Girling remote reservoir. Small (1-1/8") AP reservoir adaptor. Fits in "tin pot" AP master cylinder and small remote reservoirs. Large (3") AP remote reservoir adaptor. 3-1/2" diameter universal adaptor. Fits most late U.S. and Japanese large mouth master cylinder reservoirs. 4-1/4"x 6-3/4" square adaptor plate. Clamps to domestic tandem reservoir of the 60s, 70s and 80s. and many, many , many more uses!